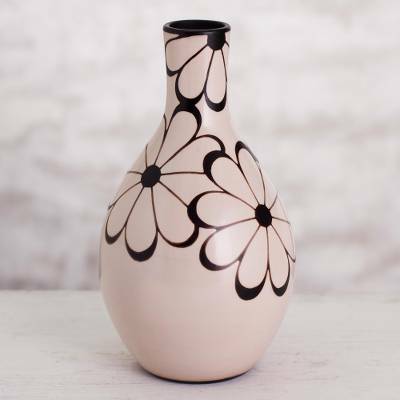 Chulucanas Ceramic Decorative Vase with Flower Motifs, "Chulucanas Garden"
Handcrafted of ceramic in the style of pre-Hispanic Chulucanas handicrafts, this vibrant decorative vase adds a touch of history and culture to your home decor. Peruvian artisan Santodio Paz creates the vase, adding black floral motifs over the white ceramic using a resist technique with pigments from the mango tree leaf. 31 cm H x 17 cm Diam. 12.25" H x 6.75" Diam. Santodio Paz has received a $200 microcredit loan with 0% interest. "My ceramics are characterized by their spherical and symmetrical shapes. I depict birds, flowers and motifs from my Piura homeland where I grew up." Santodio Paz Juarez was born in Chulucanas in the Peruvian province of Piura. He considers himself a born ceramist, and his expert hands create beautiful designs with different kinds of clay. "I've been immersed in the world of ceramics for as long as I can remember," he says. "But it wasn't until 1986 that I decided to work at it full time. It gives me great satisfaction to be able to represent my town with my work. I'm a self-taught artist. I learned by watching my parents and other master artisans in my town. Through my daily routine, I perfected my work, as well as by visiting and listening to the older artisans in the community. "Most of my designs are inspired by everyday scenes from the region. It's my nature to be creative in my work and I'm always innovating. My ceramics are characterized by their spherical and symmetrical shapes. I depict birds, flowers and motifs from my Piura homeland where I grew up. "The techniques I use are totally Inca. For example, the way I shape a piece is a method from the ancient Tallan culture and the negative space in the motifs come from the Vicus culture. "I'm always applying new designs elements to my ceramics to give them a modern and minimalist touch. They arise from my observation of the continually changing nature of beings and things, which is a process that I believe never ends. The day it stops is the day I die. "I thank God that my work has been successfully exhibited and sold in countries like Chile, Ecuador, Mexico, the U.S., Luxemburg and Finland." Chulucanas ceramics originated with the ancient Tallan and Vicus cultures of northern Peru around 500 A.D. The Vicus people contributed the technique of "negative decoration," which has become the main characteristic of Chulucanas ceramics.